President Kagame is advancing a radical agenda in Africa; an agenda to transform Africa digitally. Several countries have joined the movement.One of the countries that are interested in joining the movement is the democratic Republic of Congo. President Joseph Kabila, showed interest in this idea. He sent his advisor, Armand Yav to attend Transform Africa Summit, where he met with Rwandan authorities, then met with Dr. Hamadoun Toure, the Executive Director of SMART AFRICA and mingled with other members of the initiative. He spoke to Taarifa about his experience, and how DRC thinks about the whole idea. Taarifa: Why was DRC interested in attending the summit? Yav: I was invited in Rwanda to participate in the summit by Dr. Hamadoun Toure, the Executive Director of SMART AFRICA. I am here on behalf of DRC and in my capacity as an advisor of the president. Taarifa: How does DRC fit into this idea of Smart Africa? Yav: We are speaking of new technologies and innovations. I came to experience and see what is happening in Smart Africa and meet the youth innovators, the players in ICT in Africa and see if we can copy and integrate in the African community of ICT. Taarifa: How was the experience? Yav: It was interesting because I discussed with Dr. Hamadou Toure and Hon. Jean Philbert Nsengimana the Minister of Youth and ICT of Rwanda. We talked about the importance of DRC signing in to Smart Africa. I gathered all the necessary information required to decide on how and why DRC should join Smart Africa. But the discussions that I had with the Rwandan authorities all went well. Taarifa: Does DRC see ICT as an enabler of economic transformation and job creation, particularly for the youth? Yav: Youth employment is among DRC priorities. With globalisation today, and ICT taking a big place in the creation of new enterprises and new jobs, in DRC we give much more importance to youth related interests; reason to why we created a separate ministry in charge of youth. We are going to link ICT with youth and see how we can invest in innovative enterprises to serve the youth. Taarifa: For African countries to exploit the advent of technology, they need to invest in infrastructure and the ecosystem. What is DRC doing in that regard? Yav: We are among the African countries which are connected to the optic fiber and to do that, you must have the infrastructure to connect the country. The Congolese government has invested money in connecting the country to the internet. There is a considerable part of our national budget that goes to new technologies. Taarifa: DRC is a huge country. It is faces the same hardship as big countries such as Russia faced and still face to push connectivity to the countryside. Yav: Expensive yes. Hard? I don’t think so. Our President his Excellency Joseph Kabila has launch a big project called “Cinq Chantier” (the five construction sites). We signed with a Chinese firm to construct the infrastructures, some of them include roads and hospitals. My government has put a lot of efforts in infrastructures, but we cannot be compared to what takes place in Canada or Russia because it took them many years to be able to have the infrastructures that they have today. We inherited a country from war and we are put a lot of resources rebuild the country. Today if you came to Kinshasa you will see the progress made. Taarifa: During your stay in Rwanda, did you learn of any innovation that can be replicated or altered to fit DRC’s needs? Yav: Obviously we have seen what is happening in Rwanda. It has made a lot of progress mostly in the digital world. I would say that Kigali is the African capital of digital. You invested a lot in the new technologies, we can see that everything is digital now; we are happy about it. And what we can copy from you is that love of the digital world and I would like our lives to be as digital as it is done here[Rwanda]; because one interesting thing that I have realized here is how public services are digitalised: birth certificate, death certificate, I saw it when we visited one stall of Kigali city and saw how it is done. And I think that it is one of the things that we can copy. Taarifa: What obstacles could DRC face in implementation of ICT as an enabler of economic transformation and service delivery? Yav: There are no obstacles, it is all a matter of will. And we showed the willingness in implementing optic fiber project. It was not a priority but a timely resource. But I must say that we are looking for an economic gain through the digital world. We want to exploit partnerships, go into data services, multimedia, and see how all this brings a plus to the economy of DRC. Taarifa: DRC is known for its cultural product, the classic music. How are you exploiting this product in light of the digital world? Yav: We invest a lot in culture. We put resources into promoting artists, their products, created production industries, and through those industries is the creation of jobs. I don’t have exact numbers, but it is huge. DRC is known for having the best musicians; Koffi OLOMIDE, Papa Wemba, Werason but today there are new hits with Fally IPUPA who is now a star worldwide. We also have Fabrigas, Heritier WATANABE. It is a new class of artists who are below the age of 40 and the succession of the Congolese music and we are proud of them. What is on top today is the music as usual, but we are promoting cultural ballets, painters. It is true that we have the best musicians but also the best painters and we can exhibit it around the world. Taarifa: You come from a far East Town of Katanga. It has not had a fair share of development; what role are you playing to push the government to consider increased resources to the area? Yav: I think that information is incorrect. Because among the most urban regions we have includes Katanga province. It is the most urbanised region with the best infrastructure inherited from GECAMIN construction, because in the colonial times Belgians invested a lot in that province due to its minerals. They built towns suchas Lubumbashi, Likasi, Kolwezi, Kamina and Kalemi. These are urban cities with international standards, come and see the big hospitals. As an advisor to the president, my role is to suggest options. Am an advisor on the national level, so if I was to concentrate only on Katanga what about the other 25 provinces. We treat Katanga issues the same way we treat those of North-Kivu, Equator. 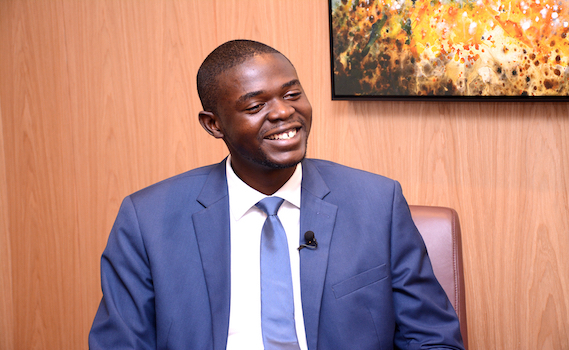 Taarifa: You are the youngest advisor to President Kabila, at 27. How does that feel like? Yav: It feels wow! And being an advisor at this age shows that the president believes in the youth. I am not there on my behalf, but on behalf of the millions of smart young people. It is also a big privilege being with the head of state; it is a big school where you learn every single day. We also have dos and don’ts but what I have learnt in these two past years as an advisor is that every day is a struggle; we see facts, secrets that we have to keep for ourselves. At the same time, I tell myself that am there as a sign of hope for other young people so that when they see me they also have their ambitions and say that “I would one day like to be like advisor Yav”. Why not, “I would like to do more than advisor Yav” so I hope that I do well my work and create that willingness in other young people to be ambitious and believing in themselves. Taarifa: Do the elderly politicians bully you? Yav: Not really, but it is not easy passing from generation to generation. Having five to six young advisors appointed by the president, first that comes in mind is that the young people have no experience, they know nothing. They don’t eve give you the benefit of doubt or let you try. Fortunately, high up there, there is no trial, we were appointed and we continue doing our job and we hope that we are serving the best of our boss’s expectations. Taarifa: How is your experience while staying here in Rwanda? Have you been here before? Yav: It is not my first time to come to Rwanda. I came last time with our national football team “Les leopards”. We came for the CAN and our mission was to bring the the cup home. I fulfilled my mission. We won the cup and I brought it back to Kinshasa. I have found nice and friendly people in Rwanda; it is generally a friendly country, but most importantly to note, Rwanda is the African digital country and it is the ‘Agaciro’ country. I would like to come back because people are friendly and you feeling comfortable. I hope to be here again for Youth Connect in July.